It was hand luggage only for our anniversary trip to Paris (and I’ll be showing you what we did and where we went soon). With each trip away my packing skills increase – I went from this to this in the space of a few months – but this time (if I do say so myself), I totally nailed it! This look won’t work for all occasions and destinations, but for a few days in Paris it was ideal – these five products gave me a quick, effortless but polished face that stayed in place in the sun. ONE: This Vichy Beautifying Sun Protection Compact is genius. Not only does it protect like a suncream, with an SPF of 30, but it gives the most flawless coverage, too. The compact is also space saving, and easy to reapply on the go. I normally wear a BB cream in the summer but wanted a more perfected look – and this certainly delivered. It’s €19.50 and comes in my shade, Sandy Beige, or the darker Golden Beige. TWO: YSL Rouge Pur Couture Mat lipstick in Orange Imagine is from last year’s Autumn collection and has been a firm favourite ever since. The shade is delicious and the rich, creamy formula is a joy to wear. It was on my lips from morning to night for four days straight, and I didn’t tire of it for a second. THREE: For the cheeks, what else but my favourite new cream blusher from Chanel? These are so, so good – check out my full review – and there’s not long to wait till they launch on August 16th! FOUR: For a fast, full brow I love Smashbox Brow Tech To Go which is super travel friendly (as the names implies!). At one end there’s an angled waterproof pencil to fill in and define, and at the other, a gel and spoolie to groom and hold the brows in place. FIVE: Bourjois Volume Glamour Max Holidays mascara is just one in a string of brilliant releases from this fabulous but affordable French brand. The portable, smaller sized tube houses a standard amount of product but is just €7.99 – and it’s waterproof, too. Snap it up while it’s still on stands – it’s limited edition, comes in four fab shades and gives lashes just the right amount of added oomph. And that’s it: five products, five minutes, done! What are your travel beauty essentials? You look gorgeous! And these 5 products are genius for a trip! That Vichy compact sounds amazing-wish it was here! I'm impressed with this Emma. Love the sound of the brow tool. Great tips. I want all 5 of these for my next trip, especially the lipstick! You look absolutely stunning, love these type of posts. Im living vicariously trough your travels and getaways :). 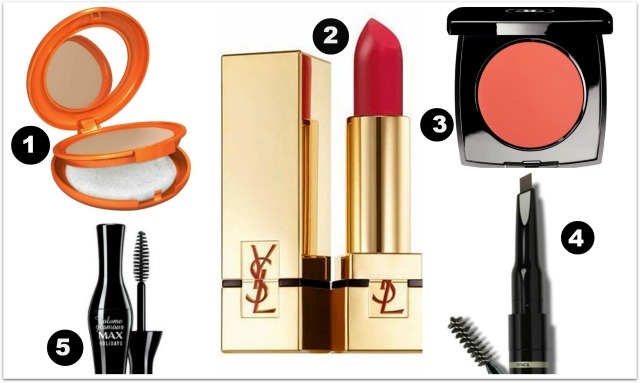 I love that YSL color - how bright and fun! My travel essentials include BB cream, sunscreen, Chanel Inimitable intense and some Sugar lip balm! You look so pretty Emma! Can't wait to hear about your trip. I love YSL! I need to try these. Thanks for the suggestions. Looking lovely and I agree on the travel essentials. Sunscreen and hand cream are travel musts for me. Emma I'm definitely taking a leaf out of your book for my paris trip. I am just bringing minimal make up! I always overpack. It takes you a few tries to learn! I can't wait to hear all about paris, hopefully you have some tips and recommendations for me! You look so pretty! Agree on these must haves, thanks for the product recommendations. So pretty! Love these photos! Those are definitely the 5 different products I would bring too! Great tips and what an awesome anniversary getaway!